On Sunday, Logan Morrison signed with the Minnesota Twins for a relatively fair value considering his track record and the current market. That move by a local player, who has stated on multiple times this offseason that he would like to sign in Kansas City, made a statement that Royals management isn’t looking to make many, if any, moves in the free agency market. The Royals stand where they do, as a rebuilding club, based on the slow development of their second wave of prospects. Guys like Bubba Starling, Brett Eibner, and Cheslor Cuthbert were to have established themselves in the big leagues by now. Instead, 2018 will stand as a proving ground for many of these players, and likely a season to decide their future in the organization. The obvious players who will get the opportunity are Cuthbert, Jorge Bonifacio, and Jorge Soler as Ned Yost said those were the players that he was making a priority to get into the lineup. In addition, not pursuing Morrison has seemingly opened the door for Hunter Dozier to grab hold of the first base spot, or even third should Cuthbert not establish himself. That foursome will be given every opportunity to grab hold of their major league roster spots. There remain a few others who will need to prove themselves in the minors or face the possibility of losing their chance in this organization. Kyle Zimmer – 2018 is likely the make or break season for Zimmer. The 2012 fifth overall selection in the draft has encountered injury after injury since his draft season and is facing his final option season with the Royals this year. At times last season he was hitting 95-97 mph in Omaha, but a loss in feel for his usually reliable and formerly dominant curveball left him vulnerable to right-handed hitters, with them hitting .317 with a .913 OPS versus him. During the season, Zimmer will need to establish that he can get Triple-A hitters out, stay healthy and then prove he’s worthy of a bullpen spot. A tall ask, indeed. Going for him – The lack of quality arms in what was a usually strong Royals bullpen in that past shouldn’t impede on him should he perform in Omaha. Going against him – Multiple arms will need to be added to the 40-man roster next winter with Foster Griffin, Scott Blewett, and Josh Staumont all needing protection from the Rule 5 draft. Miguel Almonte – Much like Zimmer, the 2013 Future Gamer is also facing a career crossroads in 2018 after encountering injury problems again and again, along with troubles with the strike zone. The latter seemed to have been corrected in ’17 with a dominant start at Double-A that was mirrored through nine outings in Omaha before arm troubles after a brief stint in the bigs shut him down. Like Zimmer, these injury problems for Almonte are pretty consistent as the right-hander has thrown fewer innings each season since his 130.2 output in ’13. The stuff for him is there still when he has been healthy, and last season when he was there, it looked better than ever. He still flashes his typical mid to upper 90s fastball, the best breaking ball of his career and his usual changeup. Despite those things going for him, Almonte faces a similar task as Zimmer, forcing him to establish himself in the majors while proving healthy before facing the possibility of getting left behind on the 40-man crunch. Bubba Starling – With Zimmer and a player who will appear later on this list, GMDM has over $12.69 million invested in first round picks facing a crossroads this season. Like the others before him on this list, Starling is facing his final option this year. Struggles from the start of 2016 through April of last season have to place Starling’s career in a difficult spot. However, an adjustment made with hitting coach Tommy Gregg had him working more of the entire field and the results improved with a 54 game stretch of .290/.327/.435 from May 1st thru July 9th before an injury slowed him down and possibly prevented a September call-up. Even that minor tick in improved results isn’t quite the stuff that would normally earn a player a move to the show, but with the large investment the Royals have made him already, then similar results should give him an opportunity to prove things on the major league roster. A good spring could even earn Starling the starting center field nod altogether. 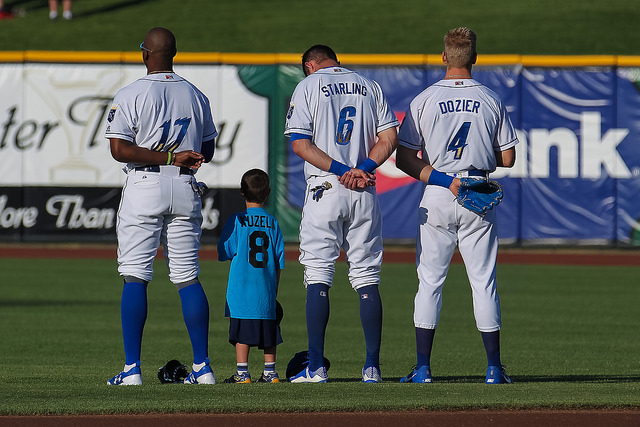 Going for him – A lack of competition against Starling with likely the biggest hurdle in his way could be Adalberto Mondesi establishing himself at second base and moving Whit Merrifield to center. Going for Starling in this scenario is the fact that Mondesi has two options remaining. Should Bubba perform in spring, the Royals can afford to send the younger middle infielder to Omaha to start the year. In addition, Starling’s defensive prowess makes him the best option for a pitching staff that will likely give up its share of fly balls, which would make him the best option for center field. Going against him – A track record of less than stellar results leaves Starling vulnerable, but much like the players ahead of him, there are few options knocking on his door. One possible suitor for his roster spot though could be Donnie Dewees, the outfielder acquired in the Cubs trade prior to last season. An addition of Dewees, Anderson Miller or a move to center by Merrifield could push Starling off the 40-man. Elier Hernandez – Latin players who struggle at any time in their career can make any roster spot a real predicament. While Hernandez has been in the organization for seven years now, he will still play this entire season at 23 years old. The slow development path of recent Royals prospects like Merrifield, Jorge Bonifacio, and Jake Junis show that the Royals shouldn’t give up on Hernandez just yet, and a strong start to ’17 may have positioned him to knock on the door already had Dewees not wiped him out in the outfield and ended his season prematurely. Going unpicked in the Rule 5 draft this winter doesn’t mean he will necessarily be out of the organization shall he struggle this season, but a lack of a move leaves him more vulnerable to players behind him and leaves him even further behind the players already ahead. Much of Hernandez’s success was batted-ball driven in ’17, but with limited minor league data that can be driven by hard contact, his 24% line-drive rate propelled his BABIP to over .400. A small sample size can explain much of this, but a repeat in 2018 will be needed to establish a spot on the Royals 40-man roster for Hernandez. Going for him – As mentioned, Hernandez’s age is going for him as is a move away from Wilmington. Many of the tools in the outfield remain as does his quick bat and a lack of position players truly knocking on the door. Going against him – It’s a numbers game in ’18 for all, with three free agents and plenty of players knocking on the door. In addition, an outfield that could feature Jorge Soler and Jorge Bonifacio under control for a number of years could limit the need to add Elier. Chase Vallot – Is he ready for Double-A? That’s the question for Vallot following a 2017 season that saw him put up an 18% walk rate and his usual better than .200 ISO rate. Still, the defensive questions remain for the backstop with a league-worst 18% caught stealing rate. The front office also sent a signal that they may prefer younger catchers with the addition of Meibrys Viloria to the 40-man and the drafting of uber-athlete M.J. Melendez. Like others ahead of him, Vallot needs to establish the fact that he can stay healthy after averaging just 90 games per season in his three full seasons in the organization. That’s on top of showing a better hit tool and better receiving skills to go with the needed improvements in controlling the run game. He may have done all of this while playing against the best group of pitching that he has faced in his career with the possibility of him advancing to Double-A. Going for him – Still just 21 years old for much of this season, it seems unlikely that the Royals would leave someone with his type of power vulnerable to the Rule 5 draft. The free agency of Drew Butera with the likely advancement of Cam Gallagher to the 25-man roster will likely open up a spot on the roster for Vallot. Going against him – Not much is going against him other than things he can’t control, but Chase will face some competition for the 40-man spot from Nick Dini who is coming off a season that saw him hit .310 with a .381 on-base percentage at Double-A in ’17. Ashe Russell – The Royals likely were hoping that the only revision to the 2015 draft day we would be talking about three years later would’ve been the outfit Ashe Russell wore. Instead, the Indiana prep player’s career is on the precipice of ending before ever reaching full-season ball. Refined mechanics and a workout change led to a loss in velocity which ultimately pushed him to wanting a change and some time away from the game. What is his status now? As they have been for two years now, the Royals are quiet on Russell. It’s not necessarily a pressing year for his future, but another season without competition will likely mean a once hopeful career was missed and the front office whiffed on another draft pick.